How do you spell relief? Today I spell it R-A-I-N. That's right. The sound you hear going down your gutters isn't the sound of squirrels sliding down the downspout. It is honest to goodness rain. Something a large part of the KFVS viewing area hasn't seen in days, weeks, and even months. We can thank the remnants of Tropical Storm Hermine for the steady rain we have had falling across the area today and in to tonight. I haven't gotten a chance to see rainfall totals in from across southeast Missouri, southern Illinois, western Kentucky, northwest Tennessee, or northeast Arkansas tonight, but I can give you a look at what the doppler radar in Paducah, Ky is detecting. This is a look at the rainfall estimates for across the area. 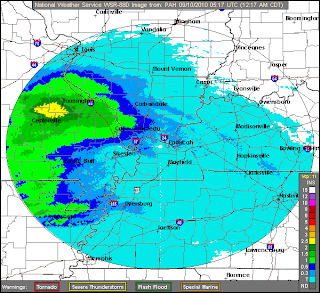 Often times, in tropical rain events the radar can underestimate the amount of rain that has fallen across the area. 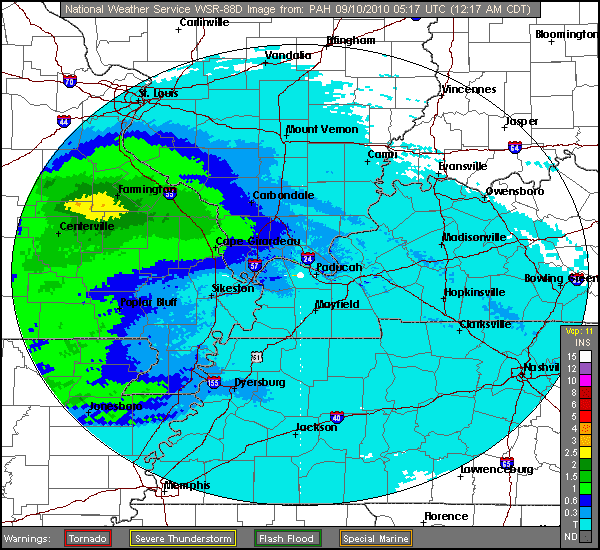 The radar is estimating perhaps over 2 inches of rain has fallen over parts of southeast Missouri through 12:17am CT Friday. As I am typing this, I can hear a little bit of thunder in the distance. I have to admit, it sounds pretty good. I won't have to turn on the rainfall sound app on my iPhone tonight to get to sleep. I can use the real thing instead. Cape Girardeau, Mo 72 - The 72 in Cape Girardeau was the coolest high temperature since May 15, 2010 or 117 days. Carbondale, Il 73 - The 73 in Carbondale was the coolest high temperature since May 20, 2010 or 112 days. Paducah, Ky 74 - The 74 in Paducah was the coolest high temperature since May 20, 2010 or 112 days. Poplar Bluff, Mo 68 - The 68 in Poplar Bluff was the coolest high temperature since May 10, 2010 or 123 days.